For any designer breaking into the business of fashion, one of the steps in that process is taking on a name for the recognition. Whether it be a brand title that you thought up or recalled from your childhood, using simply your last name, or picking a nonchalant reference to fashion itself, But in the process of doing so there are few who decide to take their own full name for the market to grab onto, mainly for the ideal that if you don't succeed then you yourself are branded that way. While others have found great success putting their name behind their work from the start. The designer we talk to today took that very risk. Gavin: Hey Krista! First off, tell us a bit about yourself. Krista: I’m a fashion designer, fashion writer and just recently, an instructor at SLCC Fashion Institute. But my real passion is designing and developing my own clothing line. In my spare time (if I had any) I’d love to travel, scuba dive, lay on a white sandy beach, hike, watch superhero movies, or just hang with my hubby and kids. Gavin: What first got you interested in design work and fashion? Krista: I have loved fashion since I was a little girl. As long as I can remember, I’ve loved shoes, clothes and sewing, and art, painting and drawing. I always knew that I wanted to do something creative and artistic. In high school, I sewed a lot of my own clothes and prom dresses, and loved that I could create something for me that was just a bit different from what everyone else had. Gavin: Did you take up any college courses or official training in design, or were you more self-taught? Krista: Initially, I was mom-taught. I was about eight when my mom started teaching me to sew, and I loved it! By the time I was twelve, I was sewing my own clothes. My “official” fashion training wasn’t until four years ago when I enrolled at SLCC’s Fashion Institute. Gavin: Prior to going into fashion you spent a number of years working the stock market. Why did you take up that profession, and what was it like for you over the years? Krista: When choosing a college major, my practical side pulled rank over my creative ambitions, and I ended up in the business world with an Accounting degree. I worked my way up the corporate ladder, eventually running a venture capital company. It was a lot of hard work and long hours but I had the chance to travel, meet great people and gain valuable skills and experience that are relevant to what I’m trying to accomplish now with my own business. Gavin: What made you decide to leave the market work and officially pursue fashion as a career? Krista: I was working so hard at building a career and after so many years of doing that, it seemed like I was missing out on too much of what my kids were doing. I eventually came to the conclusion that I wanted to raise my own kids rather than leave it up to our nanny, so I sold my percentage of the company and started a new venture as a stay-at-home mom. But I always knew that I wouldn’t be satisfied just staying at home and after a few years of carpools and PTA meetings, I decided it was finally the right time to pursue my dream of fashion design and I enrolled as a full-time student at the Fashion Institute. Gavin: What was it like for you starting your own line and get it moving at first? Krista: It’s definitely hard work; it makes all the stock market stuff look easy. It takes a confident and tenacious personality to keep going at it. It’s not like there’s an instruction manual on how to start your own clothing line when you live in Salt Lake with limited resources, suppliers for fabric, manufacturers and pattern and sample makers. I’m so thankful for all the business experience that I’ve had, it’s been invaluable. Gavin: How was the experience in releasing your first collection and hearing feedback from the public and your peers? Krista: My first collection was the collection I designed as a student for SLCC’s annual fashion show. It was my first fashion show and I was the “Best of Show” winner that year. To have the crowd cheering and get a standing ovation, well, it’s a night I’ll never forget. And the positive feedback is so valuable, it’s a great feeling knowing that what you are doing and creating is appreciated and wanted by others. It’s what keeps me going if I get discouraged. Gavin: Was it a challenge developing your self-label and designs or did things come naturally to you? Krista: I have more designs and ideas than I could ever realistically produce right now. So I guess in a way it comes naturally, but design is something that’s always in my head, it’s not something I can turn on and off. I dream about ideas, I see ideas and inspirations everywhere I go. Gavin: What made you decide to go under your own name rather than create a brand? Krista: Well Gavin, my goal is for my name to become a brand! When I was deciding what to name my clothing line, I kept trying to come up with something that sounded really cool and catchy, but nothing was coming to mind. And then I realized that all the "big" designers used their own name, so I thought, if it worked for them, well it should work for me too. That's why I ended up with my name, so, we'll just see how it goes! Gavin: What's the process like for you in creating a new design, from sketch to final product? 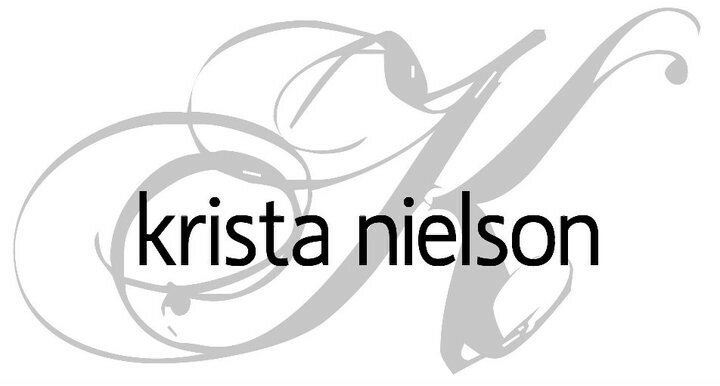 Krista: I would say most of my designs do not start with a sketch, who has time to sketch? I do this weird thing where I sketch in my head. Yeah, a lot of unusual stuff goes on in my head. And then the drawing comes later as I’m trying to refine some details. Right now, I take it every step of the way, from original idea to sourcing the materials to making the pattern, or draping on the dress form, to completing the construction of the sample. Gavin: Do you find yourself doing a lot of last minute work and touch-ups to launch, or do you know exactly what you're showing long prior to the catwalk? Krista: It doesn’t seem to matter how much time I have, because it seems I will never be done until it steps onto the runway. I’m figuring out that time management is not one of my greater strengths. Last minute work is so how it goes with me. I’m also a perfectionist, and so I’m always touching up. But I usually know how I want it to look, that is not so much last minute, but often, how it looks in my head or in a drawing, is not how it ends up turning out. So in cases like that, when I’m reworking or redesigning something it can be totally last minute, and I just have to make it work. Gavin: On the side you also do custom clothing designs for people. What made you decide to design more on a client basis? Krista: When I was just out of fashion school, it seemed to be the easiest way to start and the simplest way to get my name out there and to get some business and clients without having to invest much capital. And it is rewarding to have a personal relationship with a client and to be able to create something unique and special for them. Gavin: Which do you find easier, creating an entire line of different designs, or creating more specific works for a single person? Krista: That all depends on each individual project or line. They both have their challenges and rewards. I recently designed some custom men’s wear, which is not something I have had much experience with and it’s not something that I would do as an entire line, but it was fun and worthwhile and a huge learning opportunity that I wouldn’t have had if I hadn’t been open to custom projects. Gavin: You also do occasional freelance writing about fashion. What made you want to take a journalistic approach to fashion and what's the reception been like from people in the industry? Krista: I wouldn’t say “occasional” writing, I write a weekly column for another paper, as well as a monthly style story for The Salt Lake Tribune. I don’t think of myself as a journalist so much, but more of a fashion lover/designer with a desire to share my passion for all things fashion through writing. When the opportunity was presented, I felt that it would give me additional exposure and opportunities within the fashion industry. The reception from the industry has all been good. I have learned that fashion is something that people here want to know, read and talk about, and I am able to provide a voice and a forum for that to happen. People keep telling me that it’s about time Salt Lake had someone talking fashion. We do love style and fashion here, and now a fashion community is developing around that shared interest and love. Gavin: Moving onto local, what are your thoughts on our fashion scene, both good and bad? Krista: Whether good or bad, it’s just significant that we have a “fashion scene.” I don’t think a few years ago we could have said that. But the fashion community/industry is growing incredibly fast with nowhere to go but up. The fashion and art communities are very supportive, encouraging and motivated. We will probably never be known as a fashion anything, but we’ve got our own unique culture and vibe, and that is what we should capitalize one. Krista: In order for the fashion industry to survive and thrive here, there needs to be a viable job market and qualified workers to fill those jobs. The Fashion Institute program gets bigger each year, which is helping. But there is a huge shortage of resources for materials and supplies here. And being able to network with related professionals (photographers, make up artists, stylists, retailers, buyers, etc.) is so necessary. Anything we can do to facilitate networking and build and strengthen industry relationships is beneficial to all of us. Krista: If we didn’t have local retailers willing to promote local products, there would be little motivation for talent to stay here. They are vital to the success of start-ups such as myself. It’s great to see a shift in perception and to see people taking action, or at least thinking about where what they are buying comes from. And the support of their customers who want their dollars to stay in their own community is essential. Krista: Oh yes, but most of my shopping of late has just been window-shopping. There are so many great unique boutiques. What I prefer, by far, is working with and shopping at store/boutiques that are locally owned. I think it is necessary for our community to support local business. And it is the independent retailers that usually have the more innovative products, things that you can’t get anywhere else, and there are a whole bunch of stores like that. They usually offer so much more than what you can get from a trip to the mall. But don’t get me wrong, I haven’t sworn off mall shopping by any means, but I do try to shop locally. Gavin: What's your take on Fashion Stroll and the part it’s played in recent years? Krista: Matt Monson, Fashion Stroll founder, is a friend of mine, and has promoted and supported me every step of the way, so maybe I have a biased opinion about Fashion Stroll. But hey, it’s fashion and it’s a street festival and there’s music and dancing and shopping and runway shows, so what’s not to love? Matt has provided a venue for designers to showcase their talent, and that’s saying a lot. Especially for students or someone just starting out, the opportunity to participate in runway shows and have a booth were you can sell your product is huge. Gavin: What can we expect from yourself over the rest of the year and going into next? Krista: I’ve got some new trench coats and jackets this season that I’m just finishing and I’ve got my resort and swimwear collection that will be available this spring. Plus you can read my weekly fashion articles. I’m not going away, and you will continue to hear about me. My goal is to have my clothes readily available here in local stores and online as well. I want to create fabulous fashion for the fabulous women of Salt Lake. I can’t wait to see someone walking down the street wearing my designs. I believe that everyone should feel beautiful and confident, and I’m going to help make that happen. Krista: Check me out at my website and on Facebook. Many thanks to City Weekly for the Arty award! Stay updated with all things fashion by reading my fashion column.